Welcome to July 2013 Passing of the Pioneers, the second birthday of Western District Families monthly feature. Including this month’s obituaries, there are now 372 pioneer obituaries recorded here. You can view all of them on this link – Pioneer Obituaries – or search family names using the search box on the side bar. I didn’t expect Passing of the Pioneers would continue this long. In July 2011, I didn’t even think I would be blogging this long. Also, I have had a few desperate moments when I thought I would run out of obituaries. I started using only the Portland Guardian and the Camperdown Chronicle and then the Horsham Times, but thankfully papers like the Port Fairy Gazette (1914-1918) and the Ararat Advertiser (1914-1918) came online. Now with the likes of the Hamilton Spectator(1914-1918) and the Coleraine Albion (1914-1918) coming online I’m reassured that Passing of the Pioneers should see at least a third birthday. As it is birthday month it is only appropriate that one of the obituaries belongs to one of the great pioneering women of the Western District who left a legacy that is still around today and has a link to Trove, a source I’m totally dependent on for the obituaries in Passing of the Pioneers. .
Janet NICOL: Died July 1903 at Bridgewater. After reading two obituaries and an entry in the Portland Pioneer Women’s Book of Remembrance, I have concluded that Janet Nicol was an intelligent woman and one of the most significant pioneers to appear in two years of Passing of the Pioneers. Janet Nicol was born in Lankashire, Scotland in 1822, the daughter of Professor Andrew Nicol a linguist, University lecturer and head of a boys college. Janet, one of eight daughters, attended boarding school and like her father could speak several languages. In 1841, she married the Reverend Alexander Laurie and shortly after they sailed to Port Phillip aboard the William Nicol, appropriately, arriving in February 1842. After a short time in Melbourne, they sailed for Portland Bay. On arrival at Portland, Janet was carried ashore on a chair by the crew through the surf. It is unclear whether it was before or after her disembarkation, but on that same day, she gave birth to her first child, Alexander. The Lauries couldn’t stay at any hotels when they first arrived because of quarantine restrictions and instead camped under a shelter near the flour mill. The draughts left Janet with a severe cold and a lifetime of deafness. Alexander had been appointed minster for the Portland Bay Presbyterian ministry and went about setting up a church. 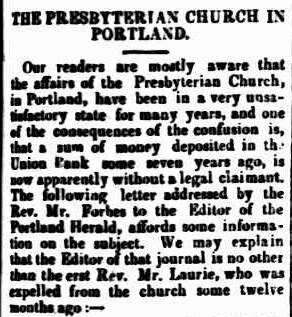 He then took an interest in newspapers and became involved with the Portland Herald. After his death in 1854, Janet took over the running of the Herald. By that time, she had four children. Interestingly the first child, Alexander was not one of those children. I can find his birth record from 1842, but in 1854 Janet gave birth to another Alexander. Therefore I would assume the first Alexander passed away some time before 1854, however, I can’t find his death record. He may have been a victim of that cold introduction to the world. That is the glossy story so far taken from the Pioneer Women’s book and the obituaries, however, I found another side of the story that I can support with articles found at Trove. The Pioneers of Port Phillip Inc website includes articles from the group’s newsletters. One of those entitled “Portland – The truth, the whole truth and anything but the truth” submitted by Jan Hanslow reveals research by Ann Grant about stories passed down over the years and the facts behind them. The Reverend Laurie and Janet are mentioned. The first revelation is the cause of Janet’s deafness. It was not the cold draughts on the first night in Portland, rather a blow allegedly inflicted by Alexander for which Janet had him charged for assault, as recorded in Police records. This and various other incidents saw him removed from the church. A report of his falling out with the church appeared in the Geelong Advertiser of July 11, 1848. That is how he really came to be at the Portland Herald, not a voluntary swing from God to journalism. The next revelation from Ann Grant was that Alexander got himself into trouble with the paper and Janet had to take over. The following article supports that claim. 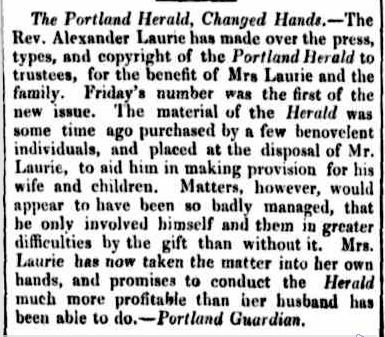 Alexander died in 1854 and after a short break, the Portland Herald resumed publication every Friday with a promise that the paper would be “renewed in strength and efficiency”. 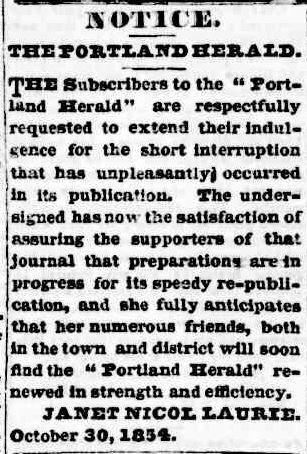 Janet finished up the Portland Herald in 1860 and she and the children went to Mt, Gambier where she assisted two of her sons in setting up the Border Watch, a paper still published today. The first edition was published on April 26, 1861 and is online at Trove. The eldest son was only seventeen then, so Janet must have been the main force behind the paper’s establishment. The name was definitely her idea as there was a Border Watch newspaper on the border of Scotland and England. Given the close proximity of Mt Gambier to the South Australian/Victorian border, she thought the name appropriate. Also in 1861, Janet married widower Joshua Black of Cork Hill, Bridgewater. Joshua was a father to seven children and Janet must have had a busy time running a paper in Mt. Gambier and the duties of matrimony at Bridgewater. Janet and Joshua had three children together, the first in 1862 when Janet was 40. By 1865 there were fifteen children from the combined marriages, aged from twenty-two to newborn. One would hope by this time Janet was leaving the running of the newspapers to her sons. Janet was buried in the North Portland Cemetery in the same grave as Alexander Laurie. The Portland Guardian of 29 July 1903 reported that “the funeral procession was one of the largest, if not the largest seen in Portland”. Henry DOWN: Died 4 July 1914 at Port Fairy. Henry Down arrived in Victoria around 1856 aged twenty-one and his first employment was at Yambuk. He was then appointed manager of St Helen’s were he displayed successful farming practices. He purchased his own land at Coddrington and continued his success. Henry married twice. His first wife, Susan Dawe was the mother of all of Henry’s six children. She passed away in 1893 and Henry married the widow of Mr William Cain. Henry returned twice to the north of England to visit his two brothers, both coal miners. James FRY: Died 26 July 1914 at Broadwater. James Fry was born in Gloucestershire, England in 1830. He married Sarah Brown in 1853, in Gloucestershire. They left England in 1857 aboard Chance bound for Port Fairy. He set up a business as a plasterer in the town and was deeply involved in the Oddfellows and the Farmers Rest Lodge. He even built a lodge room at Broadwater for the Farmers Rest masons, at his own expense. James and Sarah had eleven children and Sarah predeceased James in 1907. Silias SMITH: Died 5 July 1915 at Hamilton. Silias Smith was born in Somerset, England in 1824. He arrived in Hobart in 1855 and then in 1857, sailed for Portland, settling in the Narrawong area. Silias worked in the horticultural field and had great knowledge in both this and general agriculture. In later life, he lived with his married daughter in Heywood and later in Hamilton. Bridget McCARTHY: Died 16 July 1916 at Crossley. Born in Ireland around 1835, Mrs Bridget O’Brien arrived in Victoria in the mid-1850s. 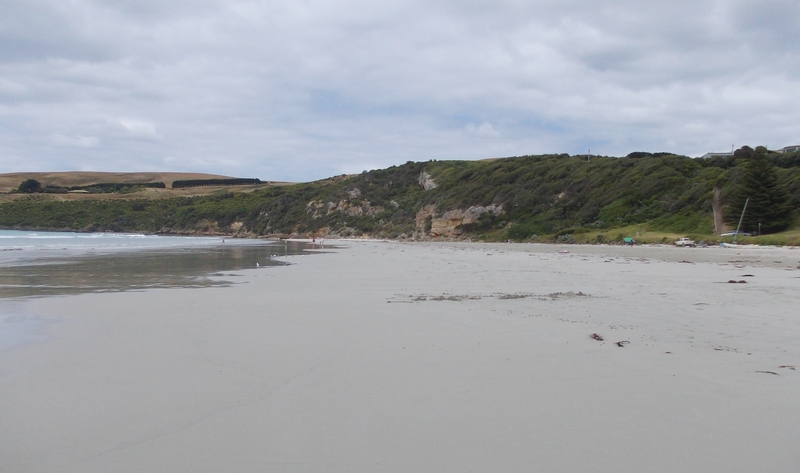 Bridget and her husband Patrick O’Brien lived at Crossley for many years before leasing their land and moving to Port Fairy North. The O’Brien’s had four children but lost three of them at a young age. They had one son John survive them. Francis McSORLEY: Died 16 July 1916 at Port Fairy. Francis McSorley was born in Ireland around 1826 and arrived in Victoria in the early 1860s aboard the Mindora, along with his wife and two sons. Francis was an expert on the Crimean War and the early history of Victoria. He worked on the railways for many years before retiring to Rosebrook. He left six sons and one daughter. Another son Patrick, a jockey was killed in a race fall in Adelaide. Thomas SHANLEY: Died 12 July 1917 at Killarney. Thomas Shanley took up residence at Killarney in 1856. He married Ellen Malone in the same year. Thomas was the road overseer for the Belfast shire for twenty-two years. John WILLIAMS: Died 26 July 1917 at Port Fairy. John Williams was born in Hobart in 1834 and arrived in Victoria as a fourteen-year-old in 1848. 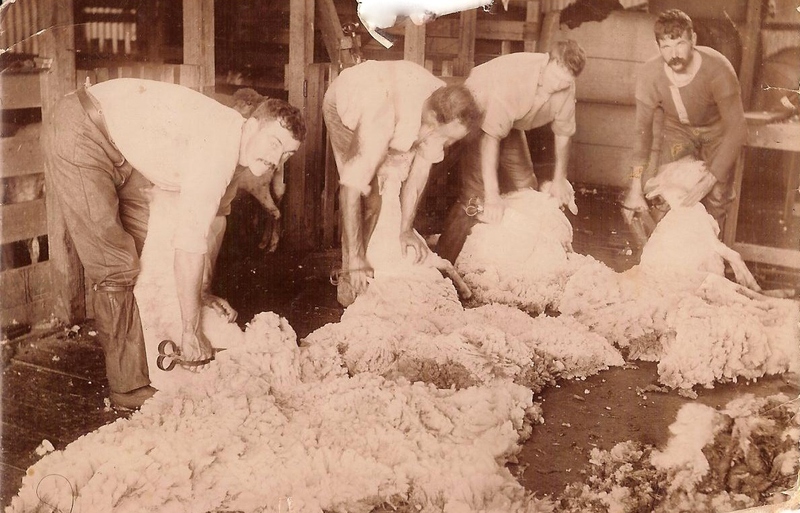 He worked on stations doing stock work and around the time of the discovery of gold, he was droving stock to Ballarat and Bendigo. He tried his luck while at each of these goldfields with no success and returned to station life and marriage in 1855. He later went to Port Fairy were he remained for forty-nine years. During that time he worked at Guinn’s Brewery and at the harbour. John and his wife raised thirteen children. Kate St George McCANN: Died 27 July 1929 at Coleraine. Kate McCann was already well travelled by the time she reached Melbourne in 1866 aboard the Great Britain. She was born on a ship just off shore of San Fransisco in 1849. Her birth certificate would have stated she was born in Stepney, London as all children born at sea under the British flag were allocated to the Parish of Stepney. Kate grew up playing on her mother’s ranch in the Rocky Mountains, California. After her mother’s death she travelled to England with her sister, living with her aunt, Emma Crouch in London. It was with Emma that Kate and her brother and sister sailed on the Great Britain. They caught the steamer Edina to Portland. In 1876, Kate married James Trangmar. They moved from Portland to Coleraine and ran a family store. The store was run by members of the Trangmar family until 1969. Kate and James had eight children, six surviving at the time of Kate’s death. Lottie McKEAND: Died 11 July 1942 at Casterton. Lottie was the daughter of Mr and Mrs Andrew McKeand of Penola and she was born there in 1875. She married James Carmichael of Argyle Station at Lake Mundi near Casterton and they moved to their own property Argyle after their marriage. 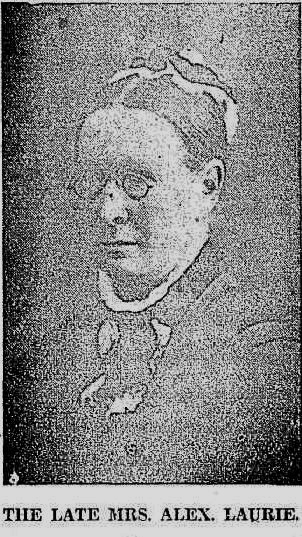 ames passed away and Lottie moved to Melbourne with her three sons to enable them to finish their education. She later married James Mitchell of Moredun Hills, Casterton, however, he predeceased her. Lottie was keen on dogs and horses and will still riding only a few years before her death. At the time of her passing, her three sons were serving with the A.I.F, with Thomas missing in Malaya.